Ornithologists are biological scientists who specialize in the study of birds. The duties of an ornithologist can vary widely based on the specific type of position they are employed in. Positions are available in a variety of areas such as academia, research, and private industry. Ornithologists in academia prepare and deliver lectures, supervise students performing lab work or research, write grant proposals, publish research, advise undergraduate and graduate students, and supervise lab assistants. Publishing research is particularly important for college professors that are trying to secure tenure at their institution. Ornithologists involved in research may conduct extensive work in the field, though lab work is also an option for researchers. Fieldwork often includes monitoring behavior, trapping birds with nets, banding birds for identification, utilizing GPS systems, tracking migration patterns, analyzing data, and publishing results. Research may be conducted for government, commercial, educational, or private entities. While studying birds, ornithologists may interact with avian veterinarians, ecologists, wildlife rehabilitators, wildlife biologists, fish and game wardens, and others in related fields. Those working in the field may be subjected to extreme temperatures and changing weather conditions while completing their work. An ornithologist may find employment in a variety of roles such as university professor, museum curator, zoo curator, researcher, public educator, or government agency employee. Positions in private industry may also be available (many recent job postings for ornithologists were from wind farms that wished to conduct environmental impact surveys). Ornithologists may specialize by studying a particular group of birds exclusively (such as raptors, waterfowl, or songbirds). They may even narrow their focus to specialize in studying a single species of interest. Some ornithologists also work with non-avian species as a part of their research. Ornithologists should pursue a graduate level (MS or Ph.D.) degree in ornithology, biology, or a closely related field that allows a concentration of avian related coursework. Advanced graduate degrees are generally required for university-level teaching positions or senior research positions. While some positions may be available to students with a Bachelor’s degree, these are generally lower paying and do not offer the same educational and research opportunities available to professionals with a graduate degree. Coursework for ornithologists generally includes classes in anatomy, physiology, reproduction, genetics, behavior, biology, statistics, population dynamics, calculus, chemistry, evolution, ecology, and zoology. Extensive lab work and research also factor into the completion of a degree in the field. Internships also enhance a student’s resume, so it is important to use these opportunities to gain hands-on experience in the field during the college years. Louisiana State University and Cornell University are particularly well known for their ornithological programs. 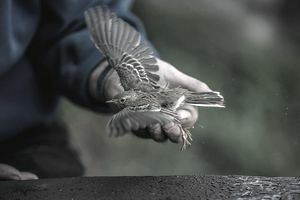 Cornell does not offer an ornithology degree in and of itself, but the school does offer several related majors that allow a student to study birds in depth. LSU is noted for its research on waterfowl and tropical species. An excellent listing of ornithological college programs can be found on the Wilson Ornithological Society’s Guide to Graduate Programs in North America. Many schools offer ornithological courses or degrees to their students. There are many ornithological societies worldwide that welcome professionals in the field. The world’s oldest ornithological organization is the American Ornithologists’ Union (AOU), founded in 1883. Other membership organizations include the Association of Field Ornithologists, the Cooper Ornithological Society, the British Ornithologists’ Club, the National Audubon Society, the Wilson Ornithological Society, and the British Ornithologists’ Union. The salary for an ornithologist can vary widely based on the level of education, years of experience, their particular area of specialization, and what specific duties the job entails. While the Bureau of Labor Statistics (BLS) does not have a separate category for ornithologist salary data, it does record salary data for the closely related category of zoologists and wildlife biologists. The BLS projects that the rate of employment for zoologists and wildlife biologists will increase at a rate of approximately 4 percent over the decade from 2014 to 2024. This is a slower rate than the average for all occupations surveyed. Ornithologists with doctoral degrees will continue to have the greatest number of employment options due to their advanced levels of education and experience.